Flute & String Trio; Flute & Violin Duo. Cairns, Port Douglas, Palm Cove and else where in Tropical North Queensland. Are you getting married & want to make your wedding even more special & magical? Jane Linstead & Orchid String Quartet will add that special elegance to make your wedding ceremony, pre-dinner drinks and/or reception even more magical. Orchid String Quartet plays all of the traditional string quartet music as well as our own arrangements of easy listening music and hits. Orchid String Quartet creates a lovely elegant ambiance that will make your special day even more perfect. Orchid String Quartet features violin, flute, viola & cello. Orchid String Quartet is renowned as being the most professional & reliable string quartet in the Cairns region. 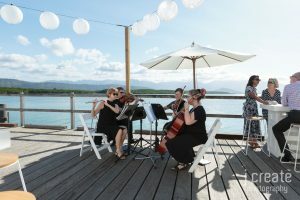 We pride ourselves on our professionalism & are very proud of our reputation as being the most respected & in demand wedding quartet in Tropical North Queensland. We will work with you to ensure that the music for your wedding ceremony is exactly what you want on your special day. Orchid String Quartet also has the flexibility to perform as a trio & duo. Orchid Trio features flute, violin & cello: Orchid Duo features flute & violin. Are you looking to add a touch of elegance to your conference or incentive social program? 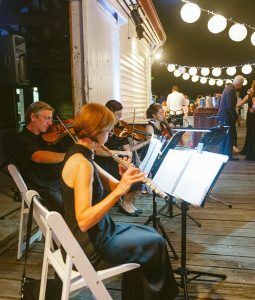 Orchid String Quartet is renowned as being the most professional & reliable string quartet in the Cairns region. We provide high quality string quartet music for elegant corporate events & other special events.